Like carpet, laminate floors and solid and engineered wood floors must be cleaned regularly or sand and dirt that find their way indoors can be ground into the surface with the same abrasive action that tears up carpet fibers. The result is a floor that gets dull, scratched or both. Kevin Mullany, president of Benchmark Wood Floors, says it’s especially important to quickly clean up spills from wood and laminate floors because wet spots hold on to and concentrate dirt and grit. When those wet spots get walked on they become abrasive and can scratch or dull the floor. Regular washing of the floor also should be done with a damp mop, Mullany says. 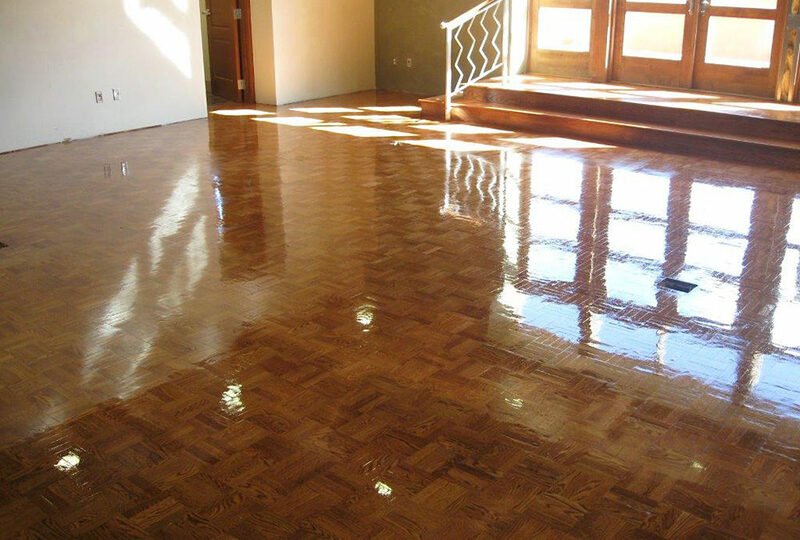 A water and vinegar solution can be used on older floors with oil-modified polyurethane finishes. Vinegar, however is not recommended for newer floors that have ultraviolet cured or water-based polyurethane, which can dull the finish. Laminate wood floors are not actually wood; rather, they simulate wood using a photographic applique layer beneath a clear protective plastic layer and a coating of aluminum oxide for durability. The inner core often consists of melamine resin and fiber board materials. Pergo, the leading manufacturer of laminate floors, recommends creating a cleaning solution of 1 gallon of warm water to 1 cup of white vinegar or ammonia, which can be put in a spray bottle and misted on the floor. While many manufacturers of mop and floor steam cleaners claim they can be used on all hard flooring surfaces, the National Wood Flooring Association does not recommend the use of steam on hard wood or engineered wood floors. Although steam cleaners use very little water, “as a practical matter, how much is too much,” says Mullany. “Whenever you inject steam into a floor there are potential problems with swelling, cupping and face cracking, especially on engineered wood floors,” which have a thin veneer wood top layer glued to several core layers. For the same reason, Pergo doesn’t recommend steam cleaning. Laminate floors, which are generally impervious, can absorb moisture at the seams, resulting in edge swelling. The use of a steam cleaner also can void the manufacturer’s warranty on some laminate products. For particularly stubborn dirt deposits or stains, or to remove gummy build-up, gentle scrubbing with a pad made of natural fibers, such as agave, can be used on wood and laminate floors, Johnson says. For tar, markers, crayon, lipstick, oil, ink and nail polish, acetone or nail polish remover can be used on laminate floors. Mineral spirits is a better choice for wood and engineered wood floors, but it should be tested on an out-of-sight place on the floor, such as in a closet, to be certain it doesn’t alter the finish, Johnson says. Candle wax and chewing gum on wood and laminate floors should be allowed to harden and then carefully scraped with a blunt plastic scraper, he says. When wood and engineered wood floors get particularly worn, for example when traffic patterns become visible, that’s the time to get the floor refinished, Mullany says. If wear spots are allowed to get down to bare floor, a simple refinishing may not be enough. Professional flooring experts sometimes can touch up the spots to match the rest of the floor, or nearly match. But depending on how big and how many wear spots are visible, it’s possible the entire floor must be sanded down to bare wood and several coats of finish built up to restore the floor’s surface. While solid wood floors are more tolerant of sanding, engineered woods, which have a wear layer typically about one-eighth inch thick, are not nearly as forgiving. Get a little too aggressive or careless with the sander and you could find yourself looking at a core layer beneath. Laminate floor surfaces can’t be sanded like wood — because they’re not wood. Many laminate flooring manufacturers do sell proprietary cleaning and maintenance products, including some to help restore the floor’s sheen. Other products, such as the LaminatorPlus System, are available from online sources. Lowe’s sells the Bona line of products, which are bio-degradable and Greenguard certified, making them safe for use around children and pets, says Jaclyn Pardini, a spokeswoman for Mooresville, N.C.-based Lowe’s. A number of polishes for wood and laminate floors contain a urethane-acrylic mix. These products have “a very fast drying time and won’t leave a waxy buildup on the floor,” Pardini adds. When a section of wood or laminate floor is so badly damaged that it has to replaced, it can be a little tricky and perhaps best left to the professionals. Solid wood floors are often glued or nailed directly to a cement or wood subfloor. Damaged sections can be cut away from the subfloor and replaced. Engineered wood floors can either be glued to the subfloor or “float” on top of it, Mullany says. Floating floors are separated from the subfloor by a thin sheet of foam and plastic that acts as a noise and vapor barrier. Floating floors nearly always have a tongue-and-groove click-locking assembly system, and laminate floors are overwhelmingly floating systems, he says. When a damaged floor board that’s part of a floating system has to be replaced, the boards leading up to the damaged board can be carefully unlocked and separated, removed and then reassembled after the damaged board has been replaced. This is far easier and more practical when the damaged board is close to a wall. When the damaged board is centrally located, it might be better to have a skilled flooring installer cut out the damaged board. This alters the profile of the tongue-and-groove tabs at the repair site, Mullany says, but the new board can be secured by gluing it to the edges of the surrounding planks. “It’s not easy, but it can be done,” he says, cautioning that it ought not be attempted by a homeowner with no experience at such repairs.